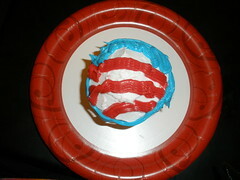 In honor of tomorrow's inauguration, today's Project 365 - Picture of the Day is a picture of my first try at an Obama cup cake. It was a little messy, but yummy. Yes we cake! Yes we cake! Yes we cake! Food for the tummy and the spirit. . .yum!